Korean Embassy in Riyadh marked the Korean national day and Armed Forces Day with great fervor. His Royal Highness Prince Mohammed bin Abdurahman bin Abdulaziz, Deputy Governor of Riyadh graced the occasion as the chief guest. 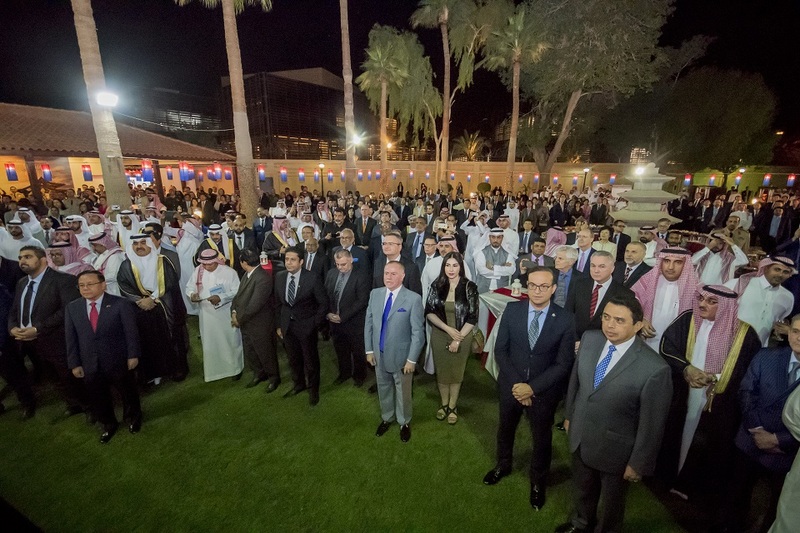 The national day reception was highly attended by the Ambassadors of various countries, Saudi Government officials, diplomatic Corps, business peoples, Saudi citizens and the Korean community. The proceedings of the reception begin with the national anthems of both countries and the cake cutting ceremony followed by the formal speech of the Korean Ambassador Jo Byung Wook. In his speech, The Korean Ambassador has said, “We are celebrating the 4,350th anniversary of the first nation state that Koreans has established in 2,333 BC. The last 100 years saw the most breathtaking unfolding of events in the Korean history. At the turn of the last century, we lost our country for 35 years, then regained it in 1945, and then were divided into two Koreas and had a war for 3 years” he said. 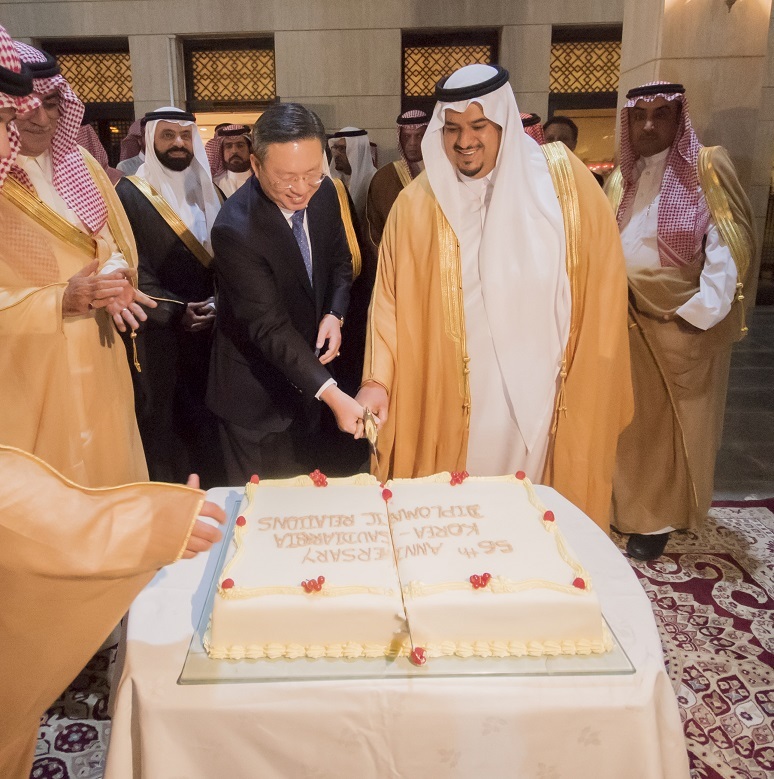 Speaking about the Korean and Saudi Arabian relations, the Ambassador has said, “As this year marks the 56th anniversary of our friendship, a new era of opportunities and challenges is beginning to unfold for both of our countries. Koreans have a special place in their hearts for the Kingdom of Saudi Arabia because the Saudis have always stood together with Koreans. Since our two countries established diplomatic relations in 1962, we have shared many common values and made joint efforts in coping with various challenges. Korea and the Kingdom have also been remarkable bilateral partners in economic and industrial fields. Korea has played a key part in the development of infrastructure in the Kingdom whereas the Kingdom has supported us in the energy sector. Kingdom is Korea’s 6th largest source of imports and our primary energy provider, and Korea is the Kingdom’s 5th largest export market”, he said. Ambassador Jo highly praised and talked about the Saudi Vision 2030, “Saudi Arabia is also going through one of the most significant moments in its history under the leadership of HRH Prince Mohammed bin Salman, Crown Prince as His Royal Highness inspires the Saudis and the world with an ambitious yet achievable blueprint of the future named “Vision 2030,” the world is witnessing the Saudi reinvigorating and realizing the potentials of their Kingdom, Korea is one of the strategic partners of Vision 2030”, He added. “The close partnership of Korea and the Kingdom is more required than ever before and I am sure that our two countries could seize the new opportunities and cope with the new challenges together as true “Rafeeq,” and further promote and deepen our steadfast and extensive relations. Korea is truly the co-pilot of Saudi Arabia in its cockpit / navigating the reform process”, he mentioned. Speaking about the Korean Peninsula he has said, “the South and the North have held 3 summit meetings during this year. At the end of the April Summit, the two Koreas adopted the historic Panmunjom declaration that sets the basic principles to eliminate military tension, to denuclearize and to establish a permanent peace on the Korean Peninsula”, he said. An orchestra of Korean nationals played their traditional music, while Saudi students showed their Taekwondo skills on the reception that was truly enjoyed by the guests.